Take your iPhone out of your pocket and look at it. See that big, bulky case? Now look at the photo of the iPhone X at the top of this post. Yeah, exactly. Just like the iPhone X at the top of this post, my iPhone looks so much better than yours and it’s not because there’s anything special about the phone itself. It’s because I’m using the insanely thin, barely there Totallee iPhone X Slim Clear Case, which might be my new favorite thing in the world. 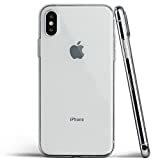 This is the thinnest clear case out there for the iPhone X by a wide margin, and here’s the crazy thing: unlike other thin clear cases, this one fits perfectly and it’s snug, so you won’t get as much dust and dirt under the edges. It’s quite possibly the perfect clear case for the iPhone X, and it’s only $17.99 on Amazon with free Prime shipping. UPDATE: We initially linked the wrong case, and the links above have been updated to correct the error. The iPhone X case we initially linked is also a great option, but it’s slightly thicker than the one we were talking about.